Right now, your child trusts you. You are the source of all good things. She knows if she hurts herself or is hungry or needs information, she can ask you for help. But how can you make sure your young child grows into someone who will continue to come to you when life gets seriously difficult? In the middle of a divorce and losing my job, the last people I wanted to speak with were my parents. They are the people who care for me more than anyone else in the world and who would probably give their lives to save mine. And yet, my parents were unavailable to me simply because I was afraid of their judgment and harsh criticism. These are people who love me and support me and care about me and want me to be successful and happy. But I just couldn’t bring myself to talk to them. It was too risky. I was terrified of the inevitable reprisals, repercussions and emotional damage that I believed would result from honest communication with the people responsible for my very life. Why can’t these people confide in their parent or caregiver? The characters would find themselves in dangerous, frightening or difficult situations that could be easily resolved with a word or suggestion or small act by an adult in the child’s life, but they never asked for help. Perhaps one reason that series is so popular was that it accurately portrays a universal childhood problem. 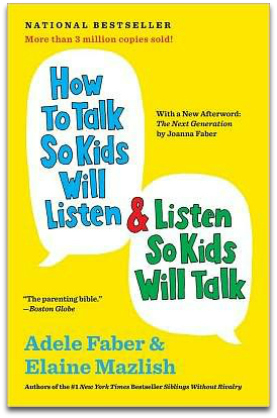 Many adolescents and young people say they cannot talk to their parents. They believe there is no adult in their life that will listen or understand. Parents, the people who love their children more than anyone in the world, are not available when their children need really help. Recently in a Humans of New York Post, a young woman said she loved her parents but had to lie to them a lot because they were conservative Christians. What a shame. She believes their beliefs prevent honest communication. Shuddering, I remembered the following conversation I recently overheard in a doctor’s office. The child was a young girl, about thirteen, and her mother was talking to her while working on her mobile phone. Child: I don’t know what to do about Michael. Mom: What do you mean? He’s such a nice boy, I’m so glad you are spending time together. His parents are very active in church; I just love them. Child: I love him too, and he says he “wants” me. Mom: Well, he’s a good boy and you’re a good girl. You know better than to get yourself into trouble. Remember what happened to that awful Christine? I heard she is having the baby. Trashy girl, trashy family. I can’t believe you were ever friends. Child: Yeah. Sure. Of course. The girl stopped talking. Her mother, still working on her phone, didn’t see the grim expression on her daughter’s face. It was heartbreaking. The mother had no idea how badly her well-meant words were received. The child was certain her mother wasn’t going to be of any use to her. Both were missing a wonderful opportunity to communicate. Mom: (putting the phone away) You don’t? Child: I love him and he says that he “wants” me. Child: But I’m not ready for getting all physical and everything. Child: No, I’m too young. I’m going to have to have a talk with him. (Changing the topic) Did you see that funny video your aunt sent? Which conversation would you rather have with your child? Which one would your child rather have? So, what can parents do to keep lines of communication open? How can we make sure that when our children are most desperate for a shoulder to cry on or wise counsel from someone who knows them best, when they need us most, they will feel free to talk with us? Part of the problem is an unavoidable dynamic inherent in the parent-child relationship, but there are some things parents can do to increase the chances that their children will be comfortable confiding in them when life gets tough. What someone DOES (0r does not do) is very different from who they ARE. Faber and Mazlish might suggest this: Instead of, “You still haven’t mowed the lawn?! You are so lazy!” we can just say, “Lawn” as a reminder of what needs to be done without unwittingly loading the conversation with labels and judgement. Children believe what their parents say. If a child hears she is lazy from her parent, she becomes a lazy person in her own mind. Her self-concept is directly impacted by those carelessly spoken words. Focusing on behavior that needs to change or the task that needs to be done rather than demeaning a child’s character helps build a healthy parent-child relationship. Celebrate little steps toward appropriate desirable behaviors. “You have started picking up the mess in your room!! HOORAY!! !” (accompanied by a little happy dance). Behavior that is rewarded is promoted and repeated. 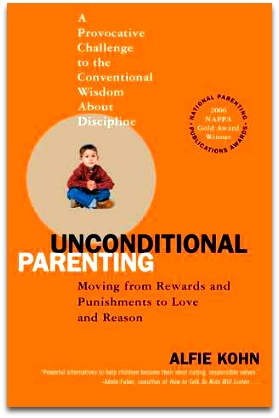 In his award-winning book , Unconditional Parenting , Alfie Kohn offers practical suggestions on how to lovingly correct the poor choices children sometimes make. Punishment does not work to change behavior over the long term. Consequences and reinforcement are effective ways to help children learn and grown. So when a child makes a mess, we can encourage him to clean it up. That’s what happens when we make a mess; we clean it up. That is a logical consequence. We don’t get sent to our room to think about our mistake. Natural consequences are things parents can allow that don’t require adult action. Natural and logical consequences are described further by Jane Nelson on her Positive Discipline website. Children usually feel bad when they do something wrong. Shaming them by highlighting their mistakes is not helpful and can lead to some negative outcomes. Sometimes they don’t KNOW they’ve done anything wrong; but usually they regret it afterwards. Understanding those feelings is an intelligent response that will make it easier for a child to feel safe confessing a big mistake to their parent later, when it matters. When children say something horrific, it is usually better not to react. To a child who is upset, negative attention is better than no attention at all. Behavior is reinforced by both negative and positive attention. So if a child says something upsetting it is good to simply walk away or ignore it when possible. It isn’t necessary for us to respond with a knee-jerk reaction of anger, fear, or worry often generated by our children’s words. Instead, active and reflective listening, such as the ones described by Parents-Central are tools that can be practiced and used much more effectively. No, it’s not okay to get pregnant at 14. But when that happens, a host of factors that no one will ever know or fully understand contributed to the situation. The way parents discuss other people’s problems or poor decisions teaches children how the parent would feel about them if they had those problems. Children worry that their parents will judge them as harshly, if not more, as they judge others. Rather than speaking about others in pejorative terms, be kind and compassionate toward people. Then, when a child has something serious to talk about, they will know they can expect to receive kindness, compassion and unconditional love from their parent. It’s not a terrible thing for children to see a parent’s sadness or anger or worry. As long as parents own their emotions and don’t blame people or circumstances, they can model appropriate emotional responses for their children. “I’m sad and I’m crying but I’ll be okay. Emotions pass and it’s okay to feel sad/angry/upset/confused. Sometimes people feel that way.” This assures children that their parent might understand when they are overwhelmed by their own strong feelings. Everybody needs someone in their life they can talk with about anything. Wouldn’t it be marvelous if your child could have that sort of relationship with you? When your young child grows into an awkward teen or confused adult, will he know with certainty that you will respond to his problems with love, compassion, empathy, understanding, and acceptance? And when your daughter is grown and trying to make a decision or work through a difficult problem, wouldn’t it be marvelous if she could benefit from your wisdom? It isn’t easy to always act like a mature grown-up when raising children. It isn’t easy to recognize or manage our own fears and angers and negative emotions when we are interacting with our own children. But if we can, the dividend of a life-long strong and supportive parent-child relationship that is worth the effort, both in terms of parental satisfaction and child development. Think about a parenting episode that occurred in the past week. Review your verbal and nonverbal response to your child: What words did you use? Did you make eye contact? Where was your focus during the interaction? Mentally re-write (or, even better, quickly actually re-write) the episode. In this version, keep the child’s part the same, but make a change to your own behavior or words that would have improved the likelihood of strong future communication with your child. Maybe you could phrase something differently or position your body differently or use a different tone of voice. Simply observe and accept what happened, and then think of way to alter your response or action that would increase the chances that your child will grow into someone who consider you a safe confidant. Resolve to occasionally and randomly review future parenting episodes, without harshly judging yourself, as a way of observing what you do and imagining a new and better approach that you might use in the future. Listen to your words carefully; pay attention to the way your child might be hearing them. Speak with acceptance and compassion about people who are experiencing difficulties. Try to do active listening with a friend or partner who will give you feedback. It isn’t easy to simply listen to anyone without judgment, but if we can learn to do it with another adult, we can do it more easily with our children. Practice looking at yourself gently, accepting your own thoughts and behaviors with compassion as you recognize that no one is perfect and our parenting is an on-going skill we can always improve. Teresa Buchanan has been a tenured professor of early childhood education for over 20 years. She has a Ph.D. in Child and Family Studies from Purdue University, a M.S. in Child Development, and a B.S. in Business Administration. She’s published many scholarly articles about teaching and is now enjoying the opportunity to write about parenting. With their skillful father, she raised two outstanding young men. Her work merges knowledge from research and theory with wisdom gained from the practical experience of successful parenting. Wonderful article! It’s easy for parents to forget that their attitude toward kids’ small mistakes lays the groundwork for their role in the bigger issues in their children’s lives. Beautiful article, enjoyed reading it, I will definitely incorporate the tools & techniques pointed out in this article. I hope my parents incorporated some of the positive parenting tools while I was growing up, I would have had a much better relationship with my parents. Thanks for your kind words about the article, Sneha. I am so happy to read that you have chosen to be the person who sets the foundation for a different style of parenting that will get passed down for generations to come. Wish you the very best! Ever since the kids were small I told them, they can always come to me for anything. If they think I will be mad that’s what they need to start out with, “Mom, I think you might get mad.” I told them when I hear that, they have my promise that I won’t get mad, I will hear them out fully. If it will make me mad, I promise that I will walk away, pray about it, and then afterwards we will figure out our plan of action. Most times they came to me because they broke a dish or spilled Kool-Aid on the carpet and for these things they thought they were too scared to tell me, it really wasn’t that big of a deal to me, we simply took care of those things [at least before the Kool-Aid completely set into the carpet :)] We took care of the issue and it simply begins with the small things that they learn to come to me about. Bottom line, I told them I am their confidante, fixer, helper, and biggest cheerleader, together we will either fix it, find it, clean it, or replace it (with them working it off of course) and so far it has worked well with us. That’s brilliant, Venita! Asking our kids to explicitly say “Mom, I think you might get mad” not only puts responsibility and control in their court, but also creates a warning for us about what’s to come and a cue to stay calm and work it through. It’s so simple, yet so nuanced. I love the idea. I am definitely going to try this one with my daughter 😉 Thank you so much for sharing! I think this is a very very important article – with more practical pointers that can be followed with the youngest of kids… I just realized that I was doing something wrong (we go nappy free at home and baby is just under 2, and recently she has started crying when she has accidents – I do not want that and I realize that I have been the cause of it) – very very useful article. I’m printing it out and making notes…!!! I love your articles by the way – even those which I can possibly only implement when my baby gets a little older – they are thought provoking! Thank you for your time and effort to spread this information! Excellent post Teresa – thank you! Very thought provoking. I’m going to work on #6 and #7 straight away! It’s so true and so sad that kids can’t come to adults. I know my parents wouldn’t be the first people I’d go to in a crisis – same for my husband. I’m trying to make sure history doesn’t repeat itself with my son and your article is further inspiration. And the wonderful thing here Tracy is that whatever changes we make, no matter how hard they are, will become a part of who our kids are and will likely carry on for generations! And if our kids choose to build on the foundations we lay out, can you imagine how beautiful things will be by the time they have kids and their kids have kids? I’m getting carried away a bit, but this thought of how powerful this change can be, really keeps me going when the going gets tough. Quotes from this article will be ALL over my facebook page. #AFP!!! I’m so glad it was helpful and thank you for helping to spread the information. Our kids are 18 & 15. Our oldest will be living at home during college so I’m hoping to share this information with my husband very soon, so that maybe we can undo at least some of the damage. Thank you for the article. My older daughter is nearly 4 years old. There were incidents at preschool, where she was hurt emotionally or physically. Teachers didn’t tell me. She told me about some things the same day but not in front of the teacher. When teacher told a different versions, my daughter said “maybe she did if she said so” (did , “maybe He scratched my face, I forgot”. I’m concerned, do nearly-4-year olds talk like that, am I asking too many questions, not the right questions. I see she has learned how we are not assertive, how we don’t know how to set boundaries. I’m working on my standing up skills to help her. She tells me about feeling sad, upset, happy, loving something. She told teachers when she felt sad and missed me. I felt proud of her. I tell her I’m angry /I don’t know what to do /let me think /I’m upset. Admiting /realising angry feeling is the hardest thing. “My body. What I say goes” this book has helped us to talk about anger etc. Looking forward to reading the Unconditional parenting and the other articles linked to this article asap. Thank you.